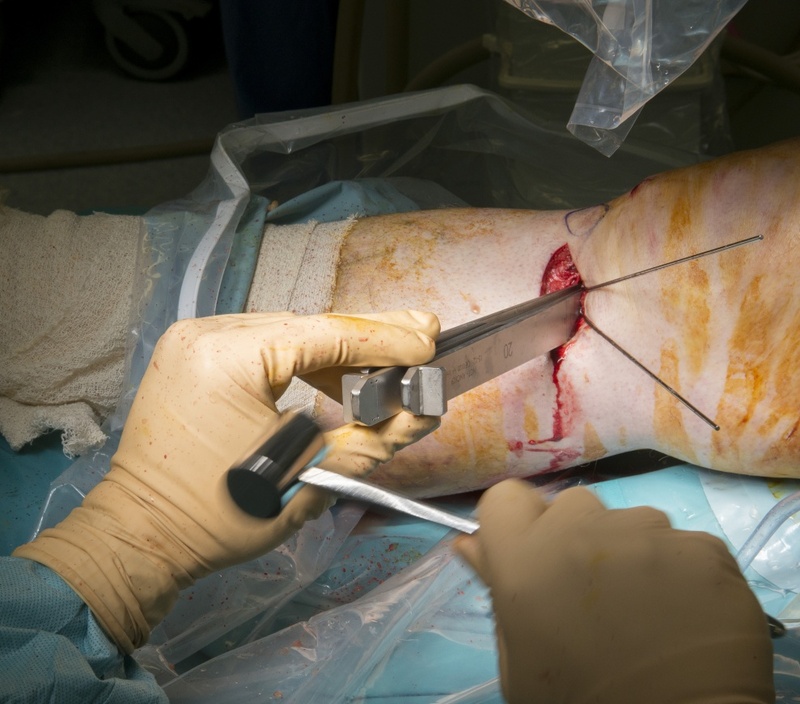 Learn the Proximal Tibial Osteotomy using a Newclip plate. surgical technique with step by step instructions on OrthOracle. Our e-learning platform contains high resolution images and a certified CME of the Proximal Tibial Osteotomy using a Newclip plate. surgical procedure. High tibial osteotomy (HTO) is a well-established and commonly used treatment for younger and active older patients with medial compartment osteoarthritis of the knee and varus malalignment. The aim of the HTO is to shift the mechanical axis from the medial to the lateral compartment in order to reduce pain and delay the application of a total knee replacement (TKR). The open wedge HTO technique via medial approach was first described by Hernigou et al. in 1987 and has subsequently become the preferred method of correction. Progression of damage to the joint surfaces due to overloading can be significantly retarded by realignment of the extremity with the aim of at least reducing the overload on the medial compartment to a value close to physiological. Further reduction of medial load by making the line of Mikulicz pass far lateral to the intercondylar eminence would only cause the lateral joint to suffer overload while taking the risk of knee knocking during ambulation. The amount of correction (valgisation) to be aimed at is still much debated. Fujisawa et al. reported good results when the Mikulicz line passed through a point between 30% and 40% lateral to the midpoint of the knee (total width of knee being 200%). Based on this, the term “Fujisawa point” has been coined, which is defined as 62% of the entire width, measured from the medial side. We advocate some overcorrection of the varus deformity to a level dependent on the severity of the medial pathology. In instability and the treatment of chondral lesions the correction is to the up slope of the lateral tibial spine. In osteoarthritis the correction is taken further to the tip or downslope of the lateral spine but not beyond the Fujisawa point.